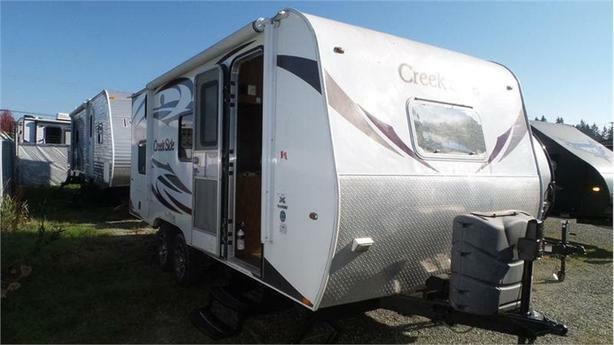 2013 Outdoors RV Creek Side 18CKAll New 2013 Creek Side you will see that this is not your basic run of the mill Fiberglass Hardwall Travel Trailer. From the Custom Built Cambered Off Road Chassis with HD Shock Absorbers, High Profile Front Diamond Plate, 15'' GoodYear Radial Tires, Adjustable Pitch Electric Awning, Triple Layered Roof Insulation, Slam Latch Cooler Sized Luggage Doors, and the list goes on... With the beautifully appointed Mountain Alder Cabinetry and Diagonal Stone flooring one will notice that this travel trailer is definitely a step above. Add in the ''Dream Soft'' Pillow Top Mattress, Two-Tone Day & Night Shades, 6.3 cu ft Fridge with Real Hardwood Front Panels, and the Tile Designed Shower with Thermal Insulated Skylight and one will be saying lets stay out here for another day!